(Phys.org) —Computer simulations of galaxies growing over billions of years have revealed a likely scenario for how they feed: a cosmic version of swirly straws. The results show that cold gas—fuel for stars—spirals into the cores of galaxies along filaments, rapidly making its way to their "guts." Once there, the gas is converted into new stars, and the galaxies bulk up in mass. "Galaxy formation is really chaotic," said Kyle Stewart, lead author of the new study appearing in the May 20th issue of the Astrophysical Journal. "It took us several hundred computer processors, over months of time, to simulate and learn more about how this process works." Stewart, who is now at the California Baptist University in Riverside, Calif., completed the majority of this work while at NASA's Jet Propulsion Laboratory in Pasadena, Calif. In the early universe, galaxies formed out of clumps of matter, connected by filaments in a giant cosmic web. Within the galaxies, nuggets of gas cooled and condensed, becoming dense enough to trigger the birth of stars. Our Milky Way spiral galaxy and its billions of stars took shape in this way. The previous, standard model of galaxy formation held that hot gas sank into the centers of burgeoning galaxies from all directions. Gas clouds were thought to collide into each other, sending out shock waves, which then heated up the gas. The process is similar to jets creating sonic booms, only in the case of galaxies, the in-falling gas travels faster than the speed of sound, piling up into waves. Eventually, the gas cools and sinks to the galactic center. This process was theorized to be slow, taking up to 8 billion years. Recent research has contradicted this scenario in smaller galaxies, showing that the gas is not heated. An alternate "cold-mode" theory of galaxy formation was proposed instead, suggesting the cold gas might funnel along filaments into galaxy centers. Stewart and his colleagues set out to test this theory and address the mysteries about how the cold gas gets into galaxies, as well as the rate at which it spirals in. 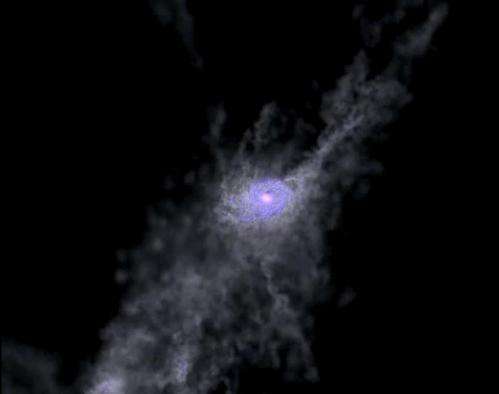 Since it would take billions of years to watch a galaxy grow, the team simulated the process using supercomputers at JPL; NASA's Ames Research Center, Moffett Field, Calif.; and the University of California, Irvine. 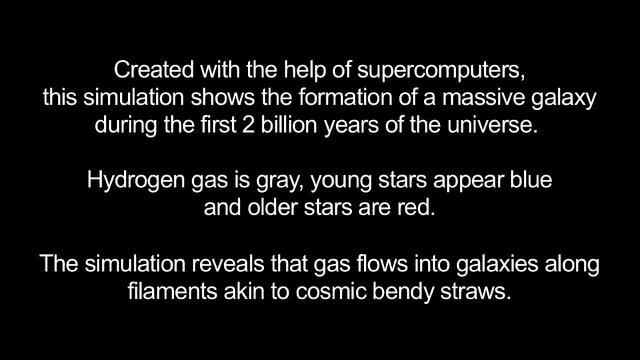 They ran four different simulations of the formation of a galaxy like our Milky Way, starting from just 57 million years after the big bang until present day. The simulations began with the starting ingredients for galaxies—hydrogen, helium and dark matter—and then let the laws of physics take over to create their galactic masterpieces. Supercomputers are needed due to the enormous number of interactions. "The simulations are like a gigantic game of chess," said Alyson Brooks, a co-author of the paper and expert in galaxy simulations at the University of Wisconsin, Madison. "For each point in time, we have to figure out how a given particle—our chess piece—should move based on the positions of all of the other particles. There are tens of millions of particles in the simulation, so figuring out how the gravitational forces affect each particle is time-consuming." When the galaxy concoctions were ready, the researchers inspected the data, finding new clues about how cold gas sinks into the galaxy centers. The new results confirm that cold gas flows along filaments and show, for the first time, that the gas is spinning around faster than previously believed. The simulations also revealed that the gas is making its way down to the centers of galaxies more quickly than what occurs in the "hot-mode" of galaxy formation, in about 1 billion years. "We have found that the filamentary structures that galaxies are built on are key to how they build up over time, by threading gas into them efficiently," said Leonidas Moustakas, a co-author at JPL. The researchers looked at dark matter too—an invisible substance making up about 85 percent of matter in the universe. Galaxies form out of lumps of regular matter, so-called baryonic matter that is composed of atoms, and dark matter. The simulations showed that dark matter is also spinning at a faster rate along the filaments, spiraling into the galaxy centers. The results help answer a riddle in astronomy about galaxies with large extended disks of material spinning around them, far from their centers. Researchers didn't understand how the outer material could be spinning so fast. The cold-mode allows for this rapid spinning, fitting another jigsaw piece into the puzzle of how galaxies grow. "The goal of simulating galaxies is to compare them to what telescopes observe and see if we really understand how to build a galaxy," said Stewart. "It helps us makes sense of the real universe." Failed theory? Not to worry, add DM to what ever quantity you need to save failed theory and voila! Theory saved from the dust bin of history where it belongs. DM was always in the model since the DM forms the filaments and knots first and the baryonic matter falls into that. The change here is that they had assumed the infalling gas was hot but that had some discrepancies with the observations. Using colder gas fits better. That's how our understanding gets refined. You do know that "dub30.com" is a scam right?? Give or take. Rough energy density figures are 72% dark energy, 23% dark matter, 4% for the hydrogen/helium plasma between galactic clusters and <1% for all other matter and radiation so 23% / 28% is ~82%. These figures are from early last year and have been updated by the first Planck probe results. The blowout event at around the 0:46 mark in the movie looks interesting. I wonder what part of the simulated physics caused that. Consider for a second how crazy all of this is: We can all see that laboratory plasmas can form filaments and knots by simply looking at a novelty plasma globe. And we can see from radio observation of HI hydrogen at the 21-cm wavelength that the molecular clouds are oftentimes highly filamentary and knotted. But, rather than supposing that the cosmic plasma is behaving as the laboratory plasma due to classical E&M concepts -- resistance, electric fields, ExB, etc -- the modelers here decide to infer filamentation and knotting due to dark matter construct. With all due respect to the modelers -- who I'm sure are incredibly talented at what they do -- it honestly seems to me that the price paid for refusing to critically think about what you're doing here is that all of this research will eventually be thrown away as GIGO. Those who are suggesting classical explanations might be ostracized, but at least their research will be cited 100 years from now. You don't seem to understand what is going on here. Look at the first few frames, the mix is fairly uniformly spread. From there on, every particle moves only due to the action of gravity simulated by the computer. The filaments etc. form automatically as a result, the modellers have no input to that part of the process. In dense aether model only small galaxies are formed like that and it promotes the symmetry of mechanisms. These larger ones rather condensing from huge cloud of dark matter at the single moment and the resulting giant white holes - gravastars are ejecting their excessive matter into outside. The similar threshold can be observed in formation of large and small planets and stars: the small stone planets are forming with accretion, whether these large gaseous ones rather with condensation of already formed blobs of interstellar gas. Note that at the case of large mature galaxies (like the Milky Way) their central black holes are quite unconspicuous marginal objects - most of their matter evaporated already. Which DM model did they use? The properties of the particles which the modellers programmed into the simulation cannot be verified until we have a particle to study. That is the purpose of running the simulations, to see if the properties inferred will produce the phenomena we observe. "The simulations began with the starting ingredients for galaxies—hydrogen, helium and dark matter—and then let the laws of physics take over to create their galactic masterpieces." As the article states: We let the laws of physics take over, to see if what we think will give us what we see. The simulations don't give truth, they merely suggest that ya are either on the right track or the wrong track. There is way too much gun jumping going on if we are programming simulations on galaxy formation which include assumed properties of something we haven't gotten our hands on yet, we don't know which laws of physics DM obeys. By varying the parameters in the simulations, we find the values that give the closest match to observations. It helps in weeding out not wasting time in looking for things that it probably isn't. As to: What laws of physics that DM obeys? We are pretty certain it is subject to interactions with normal matter through gravity. Likewise we are pretty certain it is not much affected by electromagnetic fields. We are pretty certain it is cold and cannot radiate away energy through thermodynamical processes. The model is that DM particles respond to gravity only. The key is that we know it doesn't respond to EM. So far in 4 different articles on this site alone DM forms balls that surround galaxies, clumps, here it's filaments and knots. Right, the order is from a roughly uniform distribution with small statistical variations to thin sheets then to filaments then to knots. The normal matter follows but is also affected by EM and can cool via radiation so falls to the centre of the knots, i.e. DM forms a halo around the normal matter. we don't know which laws of physics DM obeys. Which DM model did they use? Definitely not - the pressure of radiation is apparently involved too. The pressure of radiation is the time-reversed force to gravity in shielding dense aether model. Ah, I see,,, ya are entirely correct, they would present wildly different results in your simulations. I suspect that CDM is what they used. It is the consensus "culprit" by a huge majority. Warm dark matter is very tenuous. For it to be warm is would have to interact somewhat more strongly than what we observe. Hot dark matter is just about dead. Hot dark matter wouldn't be dark, by any physics. For hot dark matter to be a candidate, someone has to explain how it can add up to 23 % of everything that is, while the hottest thing we know (photons) is < 0.01%. The number of photons is the largest physical number we have in science. There are some 10^89 in the universe. A billion for every one of the other particles. Yet it only accounts for much less than 1% of everything. With respect to the simulation I was referring to CDM, WDM, HDM when questioning which one they used. OK, I misunderstood your question, the model these days is CDM, the roll-off of the Harrison-Zel'dovich spectrum requires it. CDM would make the most sense as it would fit with the temperature of the Hydrogen and helium. DM probably decoupled around the time of nucleogenesis so the temperatures evolved separately from then. Knots and filaments indicate that self annihilation isn't a property that it posesses unless I am confused about how those structures form. Self annihilation may occur but at a very low rate. There is a possibility that the excess positrons recently detected by AMS-02 may be the result of this but it wouldn't be significant in formation modelling, the rate is far too low (or there wouldn't be as much left now). Definitely not - the pressure of radiation is apparently involved too. Nope, it is called "dark" because it neither emits nor absorbs EM so radiation pressure cannot affect it. That's how DM started condensing very early, perhaps when the universe was about 1 second old. If it hadn't, the density variations would not yet have increased enough for the first galaxies to form. Normal matter was held roughly uniform by radiation pressure until reionisation around 378,000 years, then fell into the DM structures which had already formed. Zeph, ya might want to reread/rethink that one. Why ya ask me? Because he seems to be responding to your response to someone else. You didn't quote anyone so it reads as though it is your view. Regardless of who said it, it's wrong, dark matter doesn't interact with EM at all so radiation pressure doesn't apply. I wouldn't consider Jean's Instability a practical means for modelling the collapse of large DM structures into smaller ones as there is no force to counter the gravitational effect. Although it could explain knots and filaments, this process of collapse won't leave DM uniformly distributed outside the galactic plane where we find it's effects today. That is one of the inferred aspects of CDM that makes it easier to model. Since it doesn't interact through electromagnet fields or thermodynamic radiation, it can not collapse beyond a certain point. For matter to continue to collapse, such as in star formation, it must be able to radiate away energy. This why the CDM halos persist while ordinary matter can continue to collapse within these halos, to become star forming regions etc. Qstar, I agree. That is what made me question this application of it in the simulation. The structures it forms gravitationally, once formed, shouldn't change unless a gravitational peturbation occurs. But this would not cause it to spread out uniformily as we see today. I had considered that the filamentary structure of the DM remained, connected to the AGN and gave rise to the arms or bars, but this would be easily detectable and would have been mentioned before. Yeppers, ya got it. And that is why they run the simulations. To see if the inferred properties of CDM & the physics we know can produce what see. By the By: While pondering the formation of structures (webs, filaments, sheets, clusters, galaxies etc), keep in mind that the prevailing (by a large margin) models start with bottom-up evolution, rather than top-down. CDM has not done very much after inflation other than provide a frame for the ordinary matter to do it's interacting in. Wiki has improved over the years, good link. Within that, particles differentiate based on mass so stars will tend to congregate in the centre, or to put it another way, DM naturally forms a halo around clusters of stars or galaxies. DM doesn't feel EM effects but it will have its direction deflected by "gravitational slingshots" so no new physics beyond gravity is needed to explain the structures we see. Qstar, I agree. That is what made me question this application of it in the simulation. The structures it forms gravitationally, once formed, shouldn't change unless a gravitational peturbation occurs. But this would not cause it to spread out uniformily as we see today. That uniformity is only apparent on much larger scales. Again it's a question of scale. An AGN is a small object in the centre of one galaxy, a DM 'knot' surrounds clusters of thousands of galaxies. but this would be easily detectable and would have been mentioned before. While this is only a simulation, it models reality very well. I suppose it is inertia. The center isn't solid, so all the material falling into it would continue through to the other side, then fall back in, similar to a long period comet. Most of the life of a long period comet is spent at the aphelion. Think of the parts of a forming galaxy like that and you can see why the disk forms so far out. This isn't plasma, it's cold gas, like 3 kelvin. It's not the hot state of matter known as plasma, and therefor it does not act like plasma. It doesn't heat up to form plasma until stars form in large numbers, and that's well into the formation of the galaxy. You get bent out of shape when people talk about plasma and call it hot gas? well stop calling cold gas plama and we will be even.